Should you take fish oil supplements? Home / Living Better / Should you take fish oil supplements? Do fish oil supplements protect heart health? If you take fish oil supplements for heart health, they may not be as effective as you think. What does this mean if you currently take fish oil supplements? 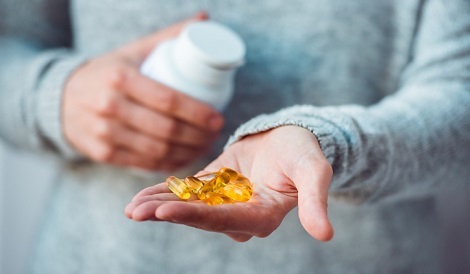 “Taking fish oil supplements is probably not dangerous, but for patients already on optimal medical therapy for heart health, the additional benefit of fish oil supplements in preventing significant heart disease is uncertain,” she says. For this reason, Dr. Green no longer recommends fish oil supplements to her patients. If you currently take fish oil or another supplement, it’s essential to talk with your doctor. Should you still eat fish for heart health? If fish oil supplements have no proven benefit for heart health, should you still eat fish and other foods with fatty acids? Dr. Green says it’s likely safe to eat a moderate amount of fish, but the overall risks and benefits to heart health are still unclear. A moderate amount is approximately one to two servings per week. Plant-based sources of fatty acids may still benefit your heart health. Know the signs of a heart attack and stroke. “If you have either, call 911,” she says. Learn the warning signs of a stroke and the symptoms of a heart attack. Learn hands-only CPR. “You may be the difference between a family member, friend or stranger surviving a heart attack, or not,” says Dr. Green. Learn more about heart health from Living Better experts.